About the Book: When her father loses his job and leaves India to look for work in America, Asha Gupta, her older sister, Reet, and their mother must wait with Baba’s brother and his family, as well as their grandmother, in Calcutta. Uncle is welcoming, but in a country steeped in tradition, the three women must abide by his decisions. My Review: If you're one of those people who doesn't read YA (young adult) novels because you think it's still all about Jessica and Elizabeth and their perfect size 6 figures or Bella's angst and longing for Edward, then you are missing out on some really good books. And this would be one of them, it's an absolute gem. Oh. This. Book. It's a perfect example of what I hope teenagers would read, to discover both: a) themselves in the pages and b) a world outside their own. 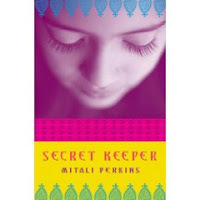 Secret Keeper is set in both a different time and a different country, but the experiences Asha has are universal in nature, they are the experiences of growing up and growing up in difficult times. The love of family runs rich and deep throughout the book, it is the foundation for the story and is woven into every event. I loved Asha, I thought she was a wonderful and spunky character, the kind I like best. :) I felt her frustration over the limitations and restrictions put on women in her culture and her grief over the revelations and events that took place. I like that she was always a teenager, able to feel things without always over processing them or knowing the full extent of the damage done, to acknowledge the choices that she was able to make. I enjoyed the progression and development of all of the characters all up until and through the heartbreaking and surprising development at the end. I didn't want it to happen, but I don't think it could have ended any other way. A huge thanks to Mitali Perkins for sending me this book to review. If you are looking to give YA a chance, you might start with this book, available for purchase here. I'm also pleased to say that while this book is not Christian fiction, it is completely wholesome and recommended for Christian teens. This sounds like it might be a good choice for the Orbis Terrarum Challenge. Thanks for the review! I love books set in other cultures and your review of this one makes me want to read it. I recently started reading YA books and I liked almost all of them.. this one definitely seems interesting as well. I visited the authors website after reading your review and saw that she has a host of other YA novels.. am definitely going to try and get my hands on at least one of them! Thanks! Tricia...I hope you enjoy it if you read it! Kathy...it's a good one. Really and truly. Ramya..me too! Yes she's written several other books, but this is the first I've read. This is on my TBR list for the Diversity Rocks challenge. It sounds like it's going to live up to my expectations--always love it when that happens! What a great review! I hadn't heard of this book before, but it's going on my TBR list! I managed to get my hands on this book after reading your review and it was a great read! I really enjoyed it. I am wishing it ended differently but I guess the ending actually made the book better! Thanks for the great suggestion.